I’m really looking forward to the Kintsugi lecture at the Ashmolean on the 24th Jan – I think places are still available. If you prefer, there’s also video information. This is too slow for me so I haven’t looked at it yet! I’m not to hung up on authenticity of materials, I like the idea of using new tech so long as it works and looks good. 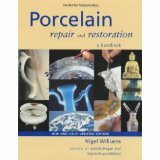 I usually mend the pot first, using techiques from Nigel Williams’ Restoration handbook. I then apply a bead of rapid-dry araldite along the crack. The knack is to to apply it when it’s partly cured, so that it doesn’t spread too far. Let the glue set for 24 hours, then apply size and metal foil – I use 23 carat gold or platinum rather than silver which tarnishes. 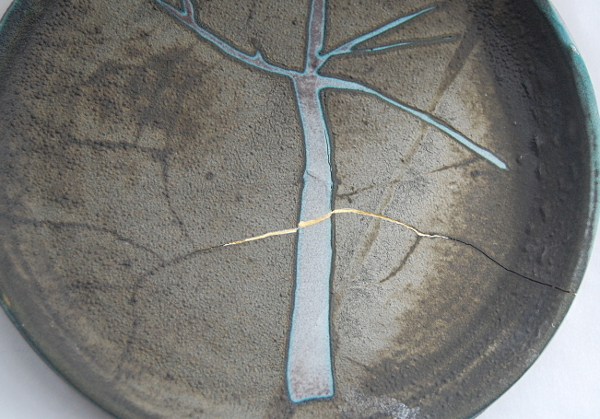 This plate, glazed with a volcanic glaze, was cracked but not broken, so I filled the cracks with milliput, then gilded over. 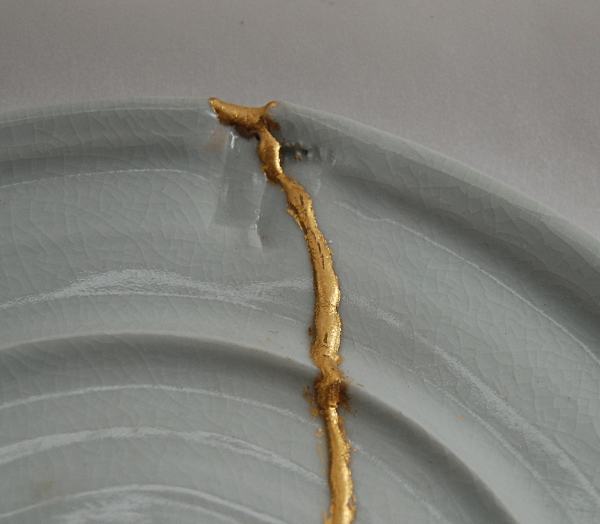 Old Japanese kintsugi is highly prized, and some is sold today – there’s a great example by Serkis. I’ve had mixed feedback from non-specialists, some hate the idea of a broken pot. But there’s a real difference between mending a break and gilding: one celebrates reclamation, repair; the other feels a bit like bling. 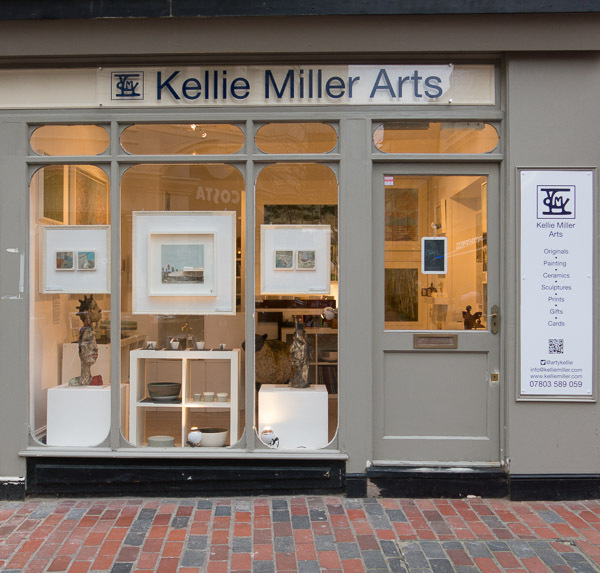 Last chance to see: Kellie Miller’s pop-up shop in Brighton closes on the 19th Jan 2014, in case you want to see my work there! The whole shop looks great! Wow! that sounds amazing – pot-mending at a bike shop too, strange but great. Thanks for the tip. Hi Carys, just discovered your blog and have subscribed for updates via email. Alas, I’m too late for the kintsugi lecture at the Ashmolean so am kicking myself. Anyway, I happen to have just blogged about attempting kintsugi-ish repairs on textiles: I collect different ways to repair fabrics, and remedying the pesky moth hole on woollens is a perennial challenge. This has to be one of my favourite solutions to date: http://scrapiana.com/2014/02/02/golden-mending/ I lifted the link your recommended for repairing ceramics, so thanks very much! Hi Eirlys – you must have seen http://tomofholland.com/ who darns… in Wovember.com they gave a prize for best darning (with Noro) which looked great. Darning in gold is a truly great idea – I have chronic moth so I will be starting to practice this tonight! Another great mash-up too, apparently this is now academically called ‘post disciplinary’. Yes! I follow Tom’s wonderful darning exploits, though we haven’t met yet, sadly. Some day. Your BF at school was called Eirlys? Wow! I have never knowingly encountered another in the flesh, though I grew up relatively close to Wales. I’ve begun to wonder if, when I finally clap eyes on another, I might turn to stone. Or a pillar of salt. Will certainly feel very odd. While on names, I know that Carys was somewhere on my parents’ (exclusively Welsh) list. Lovely name. Can’t do much better than being called ‘Beloved’, can you now? 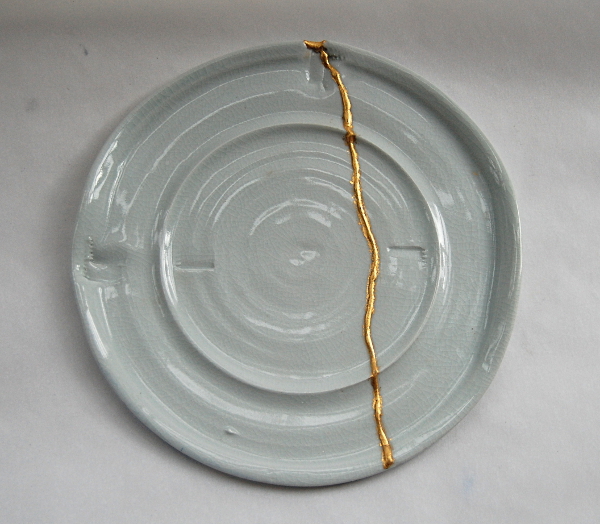 I just found out about kintsugi and happened on your post. 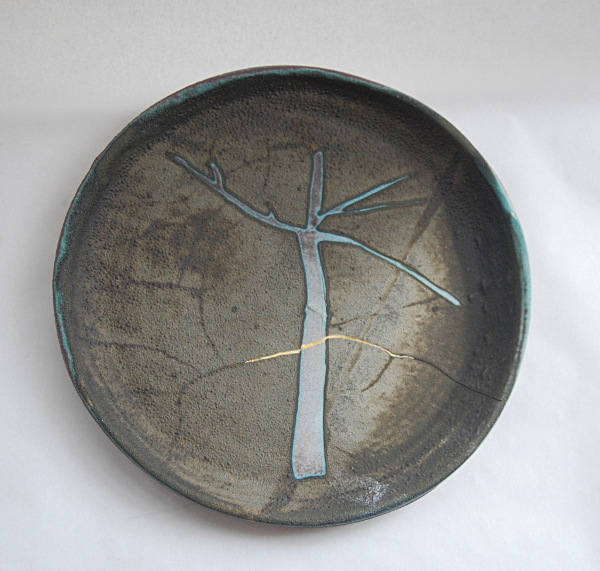 I love the tree plate you did, and how ingenious to come up with a way that worked yourself. Thanks! There’s something fascinating about mending, particularly nowadays when it’s so easy to replace stuff. Shows there’s more to it, I think!